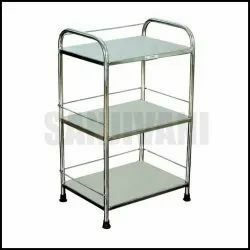 Pioneers in the industry, we offer full stainless steel bed side table from India. Backed by our years of industry experience, we are betrothed in presenting an excellent quality of Full Stainless Steel Bed Side Table. The bed is loaded with a saline rod, PU foam mattress, and four heavy duty swivel castors of 125 mm diameter (two with brake). Furthermore, the offered bed is equipped with backrest, knee rest, trendelenburg, reverse trendelenburg and height adjustment operated by screw and lever mechanism.